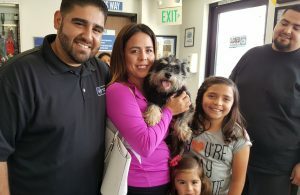 Los Angeles, CA — Dodger, a 5 year-old Miniature Schnauzer, was reunited with his family at the spcaLA South Bay Pet Adoption Center after being lost for one year. spcaLA found a microchip upon intake and were able to contact the Cabrera family of Lynwood. Without the microchip, Dodger would have never found his family. spcaLA will offer microchipping at a clinic on April 8th in West Hollywood. In 2016, the Cabrera family had just moved into a new home. Unfortunately, their two dogs escaped from the backyard when the gate didn’t latch properly. Dodger, then 4 years-old, was microchipped. His canine sister, a 1 year-old grey and white Schnauzer, was not. Imelda Cabrera said the family was devastated and searched the neighborhood and animal shelters for months before losing hope. Fast forward to March 22, 2017, when a black and tan Schnauzer was picked up by Lynwood Animal Control and brought to spcaLA South Bay Pet Adoption Center in Hawthorne. spcaLA staff used a microchip reader known as a “wand” and found a chip — but it wasn’t registered. The tenacious staff called the vet hospital that implanted the chip to track down the owner’s information, but the phone number on file was disconnected. Undeterred, the staff then mailed a letter to the Cabreras. The Cabreras received the letter and immediately rushed to the shelter to claim Dodger. The family, in tears, and Dodger, who couldn’t contain his excitement, were reunited over the weekend. Dodger was picked-up in the same city where he was lost. Most likely, he was found by someone who didn’t bother to find out if he had an owner. This is against the law, and also unfair to pet owners. If you find a pet, report it to the local animal shelter or take it to a vet or animal shelter so they can check for a microchip. Microchips are implanted between an animal’s shoulder blades. Each microchip has a unique number that when registered, will lead to a pet owner’s contact information. spcaLA is hosting a Low Cost Vaccine and Microchip Clinic Saturday, April 8th at Plummer Park in the City of West Hollywood. Microchips will be offered for $25 (registration not included). The clinic also features an array of vaccines for cats and dogs starting at $7. The clinic is from 10am-1pm, 7377 Santa Monica Blvd, 90046.